As a child I never liked sheperd's pie. It wasn't until I had my second child over a year ago that I discovered how much I actually liked it. This recipe was really, really good. This recipe can be found on page 23 of the December/January 2013 issue of Taste of Home Simple and Delicious. This recipe has enough food to create two casseroles. I used half of everything to make only one casserole. Meanwhile, cook the beef, onions, and garlic in a large skillet until the meat is no longer pink; drain. Stir in the corn and barbecue sauce. Spoon the meat mixture into two greased 13 inch x 9 inch baking dishes. 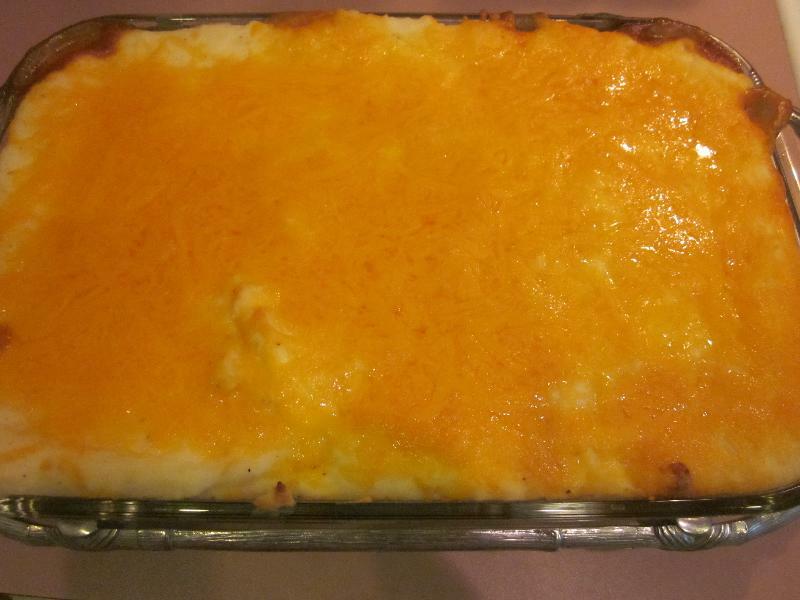 Spread the mashed potatoes over the tops and sprinkle with the cheddar cheese. You can cool one slightly and cover and freeze it for up to 3 months. Bake the other casserole for dinner for 25-30 minutes and enjoy! Thaw in the fridge overnight. Remove from the fridge 30 minutes before baking. Bake covered at 350 degrees for 1 1/4 hours or until it is bubbly. Uncover and bake 5-10 minutes longer. Description: A hearty meal that tastes great!